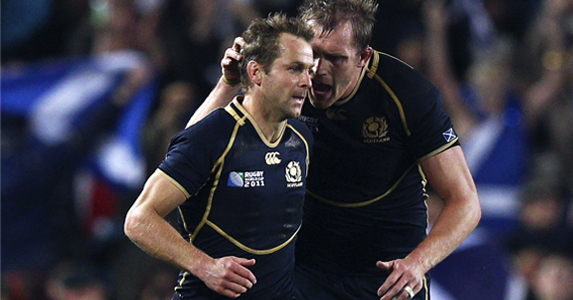 Chris Paterson, the most capped Scotsman in the history of the game, is to retire from international rugby with immediate effect. In a stellar 12-year international career, Paterson wrote his name into the annals of Scottish Rugby by breaking just about every conceivable record. His size eight and a half right boot was the most consistently prolific weapon in Scotland’s arsenal for a decade.Yet for a man that was 12½stone his ability to excel against the 6ft 5ins, 18st monsters that now regularly appear in back divisions, was a source of equal pleasure. In an exclusive interview with www.scotlandrugbyteam.org Paterson said: “I’ve always said I wanted to bow out at the highest level of the game, while I still had the ability to go on. It was a massive goal for me to play for Scotland at my fourth Rugby World Cup, especially after the injury on the day of my 100th cap. “I did get to New Zealand, not only that, I felt I played well and my final game, against England at Eden Park, was a special occasion, a brilliant atmosphere and such an intense game. Paterson, who turns 34 in March, will continue to give his all to his club, Edinburgh Rugby, for the remainder of his contract, which concludes at the end of this season, although he does have the option to extend for one year. The twin peaks of his achievements, statistically, are his caps and points for his country, 109 and 809, both records. But for those of us who have been privileged to watch him go about his business, it’s the manner in which he has performed both on and off the pitch that has made the biggest impact – the ultimate model professional and ambassador for all that is good about Scottish rugby. Paterson has set goals throughout his career and has never been one for any hoo-ha but alongside his 100th cap, there are other obvious highlights. While the debate raged about his credentials in the number ten jersey, Paterson largely kept his own counsel. “Yes, I grew up as a stand-off but I’ve played most of my rugby in the back three and, whether it sounds cheesy or not, the truth is I would have played anywhere for Scotland. “It’s not a topic that I have any regrets about. My gut feel is that if I’d stayed at stand-off I don’t think I would have had over 100 caps as you need to be in the (defensive) frontline a bit more at ten. I believe I’ve maximized what I could have done, had an amazing time and always given everything in representing my country,” he said. He captained Scotland on twelve occasions, too, and it seemed was always one of the trusted lieutenants to whom a coach would turn. His longevity in international rugby has been all the more remarkable when the era has been characterised by physicality, power and big athletes and his return from the kidney injury that he sustained on the day of his 100th cap against Wales, yet again epitomised his single-minded determination to strive for the next game and improvement. “That’s always been my focus – to think about the next game. Now I’ll be able to look back. Ian McGeechan always said that as a player you don’t own the jersey, you just fill it for the time you’re lucky enough to have that duty and you seek to make the people who filled it before you proud and also your family, friends and supporters proud. “I have to thank everybody that’s helped me along the way – from Gary Parker and Garry Callander, my first coaches at Gala, to all those at professional and representative level, especially Geech, Jim Telfer, Frank (Hadden), Mick Byrne and the current Scotland coaches. “The absolute stand-out has been Rob Moffat. He helped me through school and in my professional career and it didn’t matter whether Rob was my coach at Edinburgh or whether he was elsewhere. He was always on the end of a phone if I needed to chat something through with him, an absolute inspiration. “I also owe a huge debt of gratitude to many great players I’ve been proud and honoured to play alongside and those off the pitch who help to get a team ready, especially the medical teams led by Dr James Robson.